Hana fuda is one of the traditiona Japanese cards, which has a variety of designs that express the beauty of nature in four seasons. There is an interesting element that is each design belongs to certain month instead of putting number. The origin of Hana fuda is TENSHO CARTA, which imitated NANBAN CARTA that imported from the Republic of Portugal during 16th century. Then Japanese original card UN-SUM CARTA appeared. After that, Hana fuda appeared. It is said that in the late 17th century. 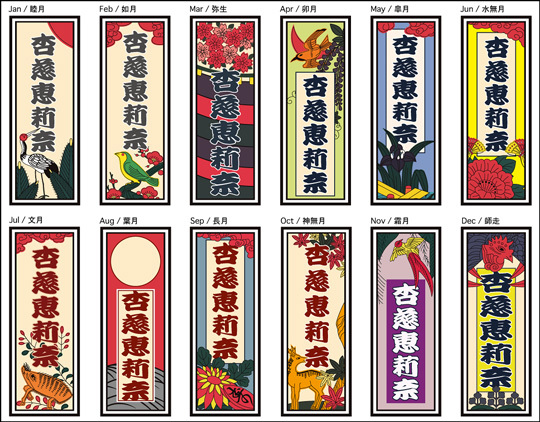 We used those Hana fuda as a motif of new Sensha fuda design and you will be able to select from 12 different designs. Each design belongs to certain month so you can select one for your birthday month. Anyhow, we are pleased if you enjoy to utilize our new face. TO CONVERT YOUR NAME INTO JAPANESE KANJI ! That's what we called "EDO NAME" ! The sample on the left(card of January) , we converted the name of "Angelina" into Japanese characters. The maximum Japanese character we can put into sticker are six. If you don't know wheather your name or nickname fit into six Japanese characters, please ask us before you make an order. We would like to make an original Sensha fuda sticker for an organization and corporation. The minimum number of order is from 10 sheets. You can put your club team name's or circle name's to make your original Sensha fuda. And also, You can use tihs product as a novelty goods or prmium goods for your fan club members. Please feel free to ask any questions and an estimation from here. In addition, when you change the base design, you need design fee separately. Please read the "How to order Sensha fuda" below before you make an order. There are important notice included. The SENSHA FUDA sticker is made with durability. However, please note that there is a possibility the sticker might come off or the color might fade away in case it was put on the things which are used in outside. Also, the ink of the sticker might blot with the sweat of hands by putting on mobile phones. Please read through Step number 1 to 9 before you make an order. Step number 6 contained most important information. We don't have to mention, but there is no red enclosure to actural store screen. Click product name which link to the product detailed page. Put the number of order and Click the "Add to cart" button. When your order is correct, click the "Checkout" button. If you are non-menber, you can still buy our products. Or you can join our menber here. When your order is correct, click the "Continue" button. Enter the custotmer information and shipping address. Check the "the shipping address is your address" box when shipping address is the same as a customer. Click the "Next page" button. Select payment and shipping method. You should select "Regular-sized mail" for shipping method. IMPORTANT：When you order Sensha fuda, please put your name, nickname, Qty for each names(if you order more than one sheets), and your country. Comfirm your order again and every information you enterd are correct, click the "Check out" button. We will send "Order comfirmation email" to your email address. Now your order is compleated. Please click the "Pay by credit card" button to finish your payment. Enter your credit card information and click the "order" button to finish payment. In addition, we are using SSL with 128bit encryption for our communication which is secure communication so that your credit card information does not leak to others.